Aberdeen Universities UNISON branch, is the officially recognised trade union for professional and support staff at both the Robert Gordon University and the University of Aberdeen. The branch works to represent and protect your interests in negotiations and consultations with the Universities. We also work in partnership to promote and enhance intiatives which benefit staff members or which further UNISON's policies. We are a single UNISON branch for the purposes of branch membership and administration, however we of course deal with two distinct employers. As such our branch is structured with a single overall branch committee, but two seperate "Stewards Committee's" at each of the Universities. The stewards committees are responsible for dealing with the employers regarding matters of negotiation and consultation, and for providing individual representation when members need us. The stewards committees are chaired by local Conveners. The branch committee is made up of elected stewards and lay officers from both Universities. The branch committee governs the overall branch activity, and meets at various times throughout the year. 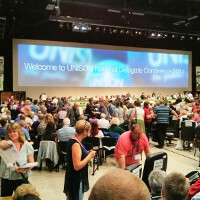 In line with UNISON's rules for branches, we have an annual general meeting at the beginning of each year, where all members are invited to come along and hear what the branch has been doing, to elect the branch committee and stewards, and to put forward any motions. We hope you'll come along - these meetings are very important for the running of the branch. Invitations to the AGM are sent out in advance by email or post to all members. We're fortunate in Aberdeen to have access to the Grampian Resource Centre, which provides the branch with administrative and legal support through the UNISON employed full time officers. The branch is affiliated to the Aberdeen Trades Union Council (ATUC), and is allowed to send nominated delegates to meetings of the ATUC. The ATUC is a body for the coordination of all trade unions in the Aberdeen and Aberdeenshire area, and is the group responsible for organising the annual May Day march, International Workers Memorial Day and the St Andrew's Day march. The ATUC was founded in the 1860s at the behest of the local trade union groups and has an office in Aberdeen. Unions train and organise workplace representatives who help union members with the problems they face at work. Reps provide support and advice and campaign for better conditions and pay.